Is Anybody Shocked that Higher Minimum Wage Mandates Are Resulting in Fewer Jobs? While economists are famous for their disagreements (and their incompetent forecasts), there is universal consensus in the profession that demand curves slope downward. That may be meaningless jargon to non-economists, but it simply means that people buy less of something when it becomes more expensive. And this is why it makes no sense to impose minimum wage requirements, or to increase mandated wages where such laws already exist. If you don’t understand this, just do a thought experiment and imagine what would happen if the minimum wage was $100 per hour. The answer is terrible unemployment, of course, which means it’s a very bad idea. So why, then, is it okay to throw a “modest” number of people into the unemployment line with a “small” increase in the minimum wage? Yet some politicians can’t resist pushing such policies because it makes them seem like Santa Claus to low-information voters. Vote for me, they assert, because I’ll get you a pay raise! All of this sounds good, and it may even be the final result for some workers. But there’s overwhelming evidence that you get more unemployment when politicians boost the minimum wage. There are no “magic boats.” In the real world, businesses only hire workers when they expect that additional employees will generate more than enough revenue to offset their costs. So when politicians artificially increase the cost of hiring workers, there will be some workers (particularly those with low skills) who become redundant. And that’s exactly what we’re seeing in cities that have chosen to mandate higher minimum wages. The Wall Street Journal opines on Seattle’s numbers. Seattle’s increase last year seems to be reducing employment. That’s the finding of a new report by researchers at the University of Washington. The study compared nine months of 2015 in Seattle, where the wage is ticking up gradually and hit $13 an hour in January, with similar areas elsewhere in Washington. …The researchers found that the ordinance decreased the low-wage employment rate by about one-percentage point. …The ordinance “modestly held back” employment of low-wage earners, and hours worked “lagged behind” regional trends, on average four hours each quarter (or 19 minutes a week). Many such individuals moved to take jobs outside the city at “an elevated rate compared to historical patterns,” says the report. …None of this will surprise anyone who understands that increasing the cost of something will reduce the demand for it. Then again, that concept seems to elude both major presidential candidates, who have floated national minimum-wage increases. By the way, it’s not just Trump and Clinton supporting this destructive policy. Mitt Romney also was on the wrong side back in 2012. And it goes without saying that Obama has been a demagogue on the issue. Let’s examine evidence from another city. Mark Perry of the American Enterprise Institute looks at what has been happening in Washington, DC. Since the DC minimum wage increased in July 2015 to $10.50 an hour, restaurant employment in the city has increased less than 1% (and by 500 jobs), while restaurant jobs in the surrounding suburbs increased 4.2% (and by 7,300 jobs). An even more dramatic effect has taken place since the start of this year – DC restaurant jobs fell by 1,400 jobs (and by 2.7%) in the first six months of 2016 between January and July – that’s the largest loss of District food jobs during a 6-month period in 15 years. Perhaps some of those job losses were related to the $1 an hour minimum wage hike on July 1, bringing the city’s new minimum wage to $11.50 an hour. In contrast, restaurant employment outside the city grew at a 1.6% rate in the suburbs (and by 2,900 jobs) during the January to July period. 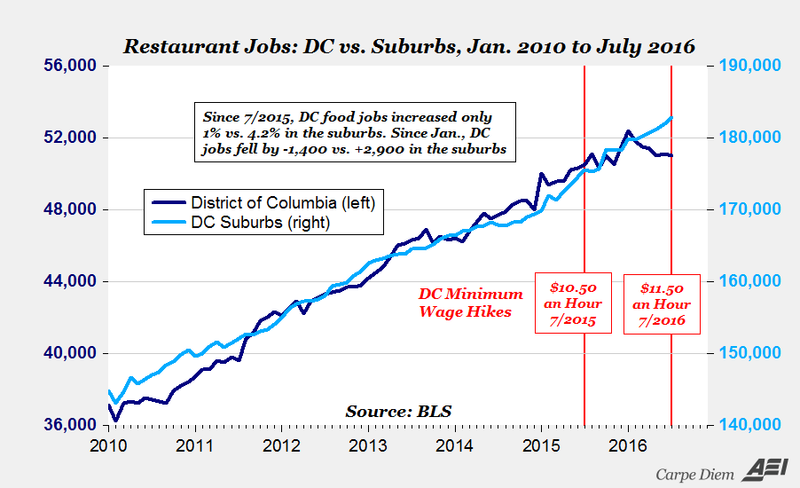 …While it might take several more years to assess the full impact, the preliminary evidence so far suggests that DC’s minimum wage law is having a negative effect on staffing levels at the city’s restaurants. At the same time that suburban restaurants have increased employment levels by nearly 3,000 new positions since January, restaurants in the District have shed jobs in five out of the last six months, with a total loss of 1,400 jobs during that period (an average of nearly 8 jobs lost every day). The last time DC experienced restaurant job losses in five out of six consecutive months was 25 years ago in 1991, and the last time 1,400 jobs were lost over any six-month period was 15 years ago during the 2001 recession. Here’s a chart looking at how restaurant employment in DC and the suburbs used to be closely correlated, but how there’s been a divergence since the city hiked the minimum wage. As Mark noted, we’ll know even more as time passes, but the net result so far is predictably negative. For additional background info, this video is a succinct explanation of why minimum-wage mandates are such a bad idea. Let’s close with something rather amusing. It turns out that the State Department, during Hillary Clinton’s tenure, actually understood that higher minimum wages destroy jobs. Indeed, her people were even willing to fight against such job-killing measures. But in Haiti rather than America, as Politifact reports. Hmmm…., I wonder if some of those textile companies made contributions to the Clinton Foundation? P.S. People in Switzerland obviously understand this issue, overwhelmingly voting against a minimum-wage mandate in 2014. P.P.S. As Walter Williams has explained, minimum wage laws are especially harmful for blacks. If this is the case, why do you have people who advocate a minimum wage hike? Good article on California’s “Go Away” attitude toward their apparel industry. Everette Hatcher III, minimum wage laws help people into the unemployment line. Everett Hatcher III, minimum wage laws help people into the unemployment line. Milton Friedman did a lot of good work on this issue. My bad. I made the comment while waiting for a plane at Heathrow. Not the best spot for nuance. There are so many idiots out there who actually believe their bile, it’s hard not to assume the worst. Sorry. I tried to be as satirical as I could be. Paragraph 1 was supposed to parody the lefty line, that mere observation of bad results cannot show that a policy is wrong. Only the lefties can declare a policy failure, and they never do. Paragraph 2 was supposed to point out that one can find counterflows even in a fast river. One can look at a small part of the river and note that some water is temporarily flowing upstream. It is an analogy to what lefties do when they survey a world of statistics and concentrate only on the anomalies which support their case. In reality, all the water eventually flows downstream. In the job market, overall employment goes down, and many of the current employees are replaced. So I am with you. Sorry for the confusion. I notice you have not read empirical studies on the subject, you have “read about” such studies. In the past minimum wage legislation has followed or been closely tied to market prices, so job losses were negligible. Current legislation makes a significant leap beyond market wage levels. An employer can be forced out of business by increases in the market wages that must be paid. Some employers will now be forced out of business by this artificial increase, and once gone a lowering of the minimum wage will not bring them back. A majority of those receiving minimum wage work in jobs catering to the poor. Either the poor will be denied their services or the price for those services must rise, as a direct result of minimum wage increases. I’m shocked. I’ve read about empirical (!) studies which show that increasing the minimum wage will often increase employment. Recent statistics after-the-fact are clearly right-wing, cherry picked, political opposition. A “study” beats mere observation every time. Have these observations been published in left-wing, peer-reviewed journals? By the way, I am leading an investigation into river flow. I have solid evidence that the flow goes upstream in special areas around rocks where eddies form. Upstream! You can see it! It is arguable that the whole river would flow upstream if there were enough rocks shaped just-so, after say 10 years of river adjustment. I have formulas and math. That is empirically proven. 35 miles East of Seattle in the little town of North Bend, after years of round the clock operation, the McDonalds franchise recently reduced their hours from 24×7 to 5am – Midnight. The Seattle wage increase places pressure on surrounding area wages, and I guess it just wasn’t profitable to be open overnight any longer. Not the highest staffing period, but how many people either lost their job or have their hours reduced at this business alone? Here’s what’s rich: the central planners hit low-skill and entry-level workers not only with minimum wage requirements, but artificially low interest rates, thanks to the coordinated actions of the central bank cartel. Low-end workers cost more *and* it’s attractive to finance equipment that makes these jobs unnecessary in the first place? These policies interact to change the threshold at which automation makes sense. If you have a large pool of low-skill workers idling — and it’s relatively easy to hire them to do jobs at market rates — it might not make sense to spend (or borrow) $X on a robot taco maker. But if the central planners signal prolonged low (or negative!) interest rates and additional minimum wage increases in the future, automate away! I don’t think even Liberals are surprised; they just think the eeeevil corporations and businesses are hoarding their pot of gold and firing people instead of paying more as instructed.